Jessie Reagen Mann (cello) and Migguel Anggelo in So Close: Love and Hate. Photo by Ryan Muir. BOTTOM LINE: At times wacky, moving, and even a bit surreal, Migguel Anggelo’s cabaret show brings a queer aesthetic to Joe’s Pub. Cabaret performances tend to follow a similar structure. An artist sings a bunch of songs, making a few comments in between each one—perhaps a story, or a short intro explaining what inspired this particular choice. While Migguel Anggelo certainly follows this basic structure, it’s safe to say that his show So Close: Love and Hate is rather unlike your typical cabaret performance. Unless, that is, you’re used to seeing cabaret performers enter dressed as Kermit the Frog. That’s how Anggelo enters the stage at Joe’s Pub, waddling out in an off-brand Kermit costume to sing—no, not “It’s Not Easy Being Green,” but rather Barbra Streisand’s “Evergreen.” And if Anggelo queers our expectations by using Kermit (or more accurately La Rana Rene – Kermit’s South American identity) to channel Babs, this sets up the rest of the evening, in which he will put his own unique (and very queer) spin on an assortment of songs about love (and hate, but mostly love). Underneath La Rana Rene, Anggelo wears a base costume of a beige camisole and boxer briefs, emphasizing how gender play is at the root of his performance. Later on, he dons a rhinestone cowboy outfit for his song “What Comes Next,” followed by a blonde wig and beige dirndl to sing from The Sound of Music. Although I’m not quite sure how “Do Re Mi” fits into an evening of love (and hate) songs, Anggelo’s rendition is wonderfully insane, as if sung by the love child of Julie Andrews and Jack Nicholson from The Shining. But the highlight of the evening, both in terms of costume and music, is “Mon Coeur S’ouvre a ta Voix” from the Camille Saint-Saëns opera Samson and Delilah. 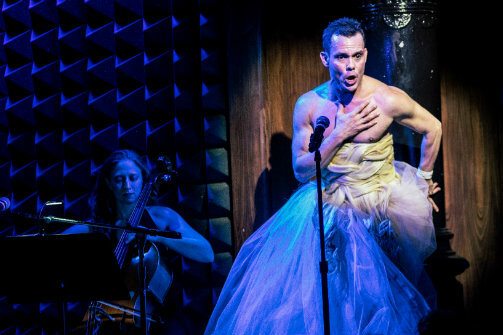 In a dress with a white tulle skirt and a corset made of woven blonde hair, Anggelo’s countertenor rendition turns Delilah’s seduction of Samson into an expression of queer empowerment. Anggelo embraces his Latin music roots, name-checking the melodramatic 80s love ballads of Pimpinela and La India in some of the evening’s more amusing bits. In contrast, his own compositions (many of which are co-written with musical director Mau Quiros) aren’t so easily identifiable when it comes to genre; the overall effect is an evening that keeps you on your toes, with each song a drastic shift from the one before. Anggelo even accompanies one of his songs, “I Guess” (which has my favorite lyric of the evening: “fish love to fly and birds love to swim”), with a jerky interpretative dance during Hery Paz’s sax solo. Given how charming and illuminating Anggelo’s brief spoken introductions are, more banter might have helped even out the tonal inconsistencies. But then again, Anggelo’s playful energy and queer aesthetics underlines how a lack of consistency is exactly the point: love is crazy, unexpected, and leaves you forever changed. So Close: Love and Hate is performed by Migguel Anggelo. Directed by David Drake. Musical direction by Mau Quiros. Original music by Migguel Anggelo and Mau Quiros, with lyrics by Anggelo, Quiros, and Drake. Costumes designed by Clint Ramos and Migguel Anggelo. The band is Mau Quiros, Hery Paz, and Jessie Reagen Mann.